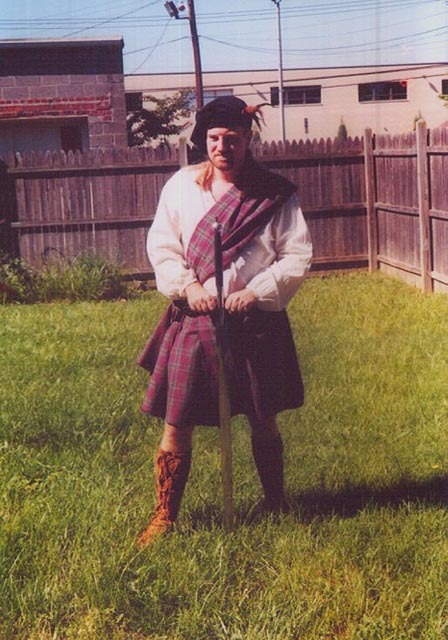 Hello, my name is David the Scot of the Wuethrai clan, and I will be your guide to Ale Quest 2000. 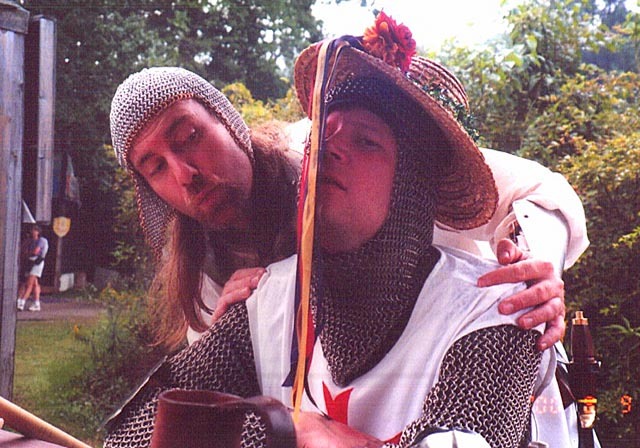 For those of you who are unfamiliar to the Ale Knights or questing, this a glorious event that our group of drunkards undertakes in order to attain of glory amongst our friends and visions of Ned. What am I doing in this picture? Why am I here? Because I am a caged beast! Shortly after this picture was taken, I started swinging my great sword and the photographer ran for her dear life. This wooden stockade fence was tossed like matchsticks upon the earth as I knocked down this shoddy attempt to confine me within. There was a great rumbling of my stomach as my Claymore fell upon the skulls of all that opposed me. Those that attempted to block my mighty blows received as swift kick of my fancy boots to their testicles. I ran about as a madman. A beast. 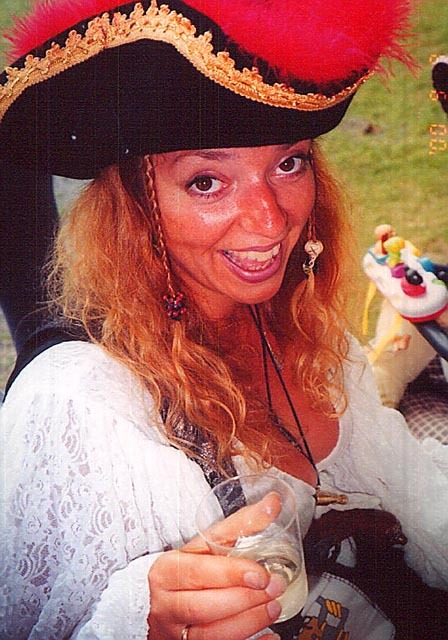 This particular Ale Quest began on Saturday September 9th at the Mimosa booth of the New York Renaissance Faire. As in the past it was a day of drinking, laughing, taking lots of pictures, and much Tom-Foolery. At left we see some of the questing Knights. This is one of the few pictures showing the Knights in an erect and sober position. First is Sir Barcardi holding the mighty standard of the Ale Quest. This standard has been to many quests and today it still smells of the fine ales into which it had been dunked. 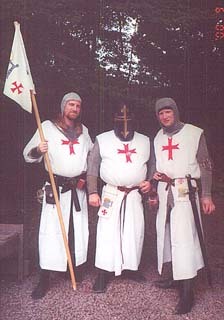 At center we see the mysterious and imposing figure of Bernie, the Duke of Chutney, who provided the very nice Crusader Surcoats from Museum Replicas. Yeah, did his burps resound and echo within this mighty black helm. Far right is Brian the Joneser, ale drinker and joker of the highest calibre. He is a bit confused and looks lost without an ale in his hand. 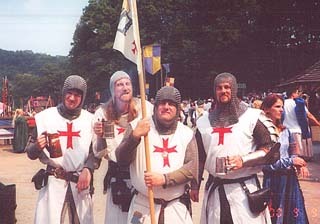 The armor is required as protection from those who would prevent these Knights from having a drink. A plague upon their souls. All are anxious and hoping to get their hands on some fine ales. As usual, the Ale Maidens Mary, Marta, Justine and the newest ale Maiden Gwenyth, were in attendance. Here we see Marta showing off a rare moment: a partially full drinking cup. Luckily the camera shutter is fast and has caught this drink in mid flight on its way to her mouth. Notice the fancy pirate hat. What appears to be a group of feathers is actually a bed of flames that shoot from her head as the alcohol is processed and rendered unto her body. At one point Lady Justine was having trouble with Gwenyth's carriage and shouted "Ale Knights help me!" Mary turned to her and said, "Look at who you're asking for help!" Sir Bacardi has no memory of this instance, so it must have been have been as he was stumbling drunkenly to the next pub. At one point in the day we ran into a stranger wearing the same tunic as us. He was having a beer so we knew he was kindred. After this photo, all four knights performed a mighty power-blow that which would be envied by the mightiest dragon. Yeah did many slaves and tawdry types wallow in the steaming bile that was cast upon the ground. During this quest, Sir Bacardi attended the Turtle Races for the first time and found it hilarious. The turtles were mocking him for they were mock turtles. Why Sir Bacardi found this funny, no man shall ever know. It is ventured that the drunken Bacardi was prone upon the ground giggling in delight at the armoured beasts. Near closing time Sir Bacardi went to get the last Boar platter of the season. Since it was so late they really piled on the Boar meat and baked beans! Lady Mary stayed clear of Sir Bacardi the next day. Chutney was complaining that the boar was not as good as previous quests. In fact in this picture we see the Duke complaining of ye old stomach ache perhaps brought upon by an imbalance of the four humors. 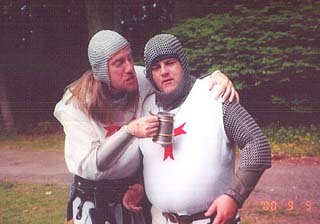 The good knight Bacardi is recommending more ale to stave off the evil spirits that are affecting the Duke. Supposedly the Knights learned a lesson from previous Quests and made sure to eat and drink water so they wouldn't get sick drunk and puke all over the fine grounds of the upstate New York fair. Whether this noble aspiration was acheived is unknown but to the mind of our Lorde. The knights completed their quest at Matty Groves Tavern as usual. All were pretty loaded. However all were not pretty as attested to by this fine image. Here the Joneser contemplates the meaning of the coloured ribbons festooned before his eyes. As he moans with delight, Bacardi is surprised with dexterity a skill with which he balances the gay jumble upon his head. Steady there Jonser, the hat is tipping backward! Luckily Bacardi holds him to his stool as he performs this delicate act. Hilo hoe, hoooray! Pictures graciously provided by Sir Bacardi and Lady Mary.